Alan Vasquez definitely made an incredible impression in his most recent fight. He was lined up to come up against Axel Cavares. And while the fight did not last long, it ended in one of the most dramatic ways many MMA fans have ever seen. The fight begins with both Axel Cavares and Alan Vasquez circling each other looking desperately for a way to weaken the opponent. While some punches are thrown, there is very little contact made by either fighter until things start to heat up quickly. Once contact is made, it take seconds for a winner to be found. But what is truly astounding is how both MMA fighters knocked each other out at exactly the same time. Both leave their faces unprotected while going for an offensive move of their own. Then both manage to make contact with each other’s faces simultaneously. Both falling instantly to the ground in a double knockout. 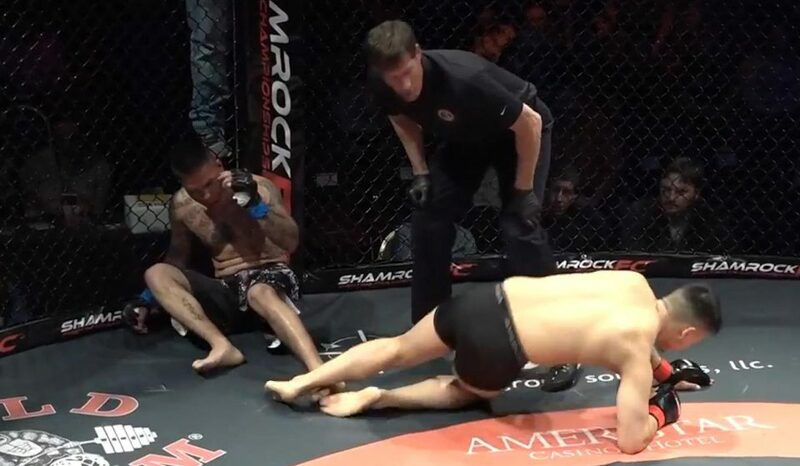 With both fighters on the ground, Alan Vasquez is able to pull himself to his feet before his opponent, Axel Cavares. Alan Vasquez suffered from a broken nose, but still managed to pull himself to his feet before Axel Cavares. By making it up first, he secured himself the win in the insane and bizarre match. You can watch the short and dramatic fight here and fight below. Watch how both opponents reach out at exactly the same time and manage to make contact with enough force to take each other down to the ground with incredible accuracy at exactly the same time. Both fighters were quickly attended to by medical professionals on scene after the brutal take down they both experienced. While Alan suffered a broken nose, it seemed to be worth the pain to take home a win at the fight that took them both down.